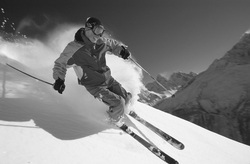 Skiing and other winter sports are increasingly popular, but how many people are putting unnecessary strain on their body with poor techniques and habits. Simple tips, techniques and exercises, based on the teachings of the Alexander Technique, can help improve balance, skill levels and performance. Alexander Technique focuses on positive ‘body use’ – ensuring correct, effective posture, and economy of movement and effort. This means your musculo-skeletal system is working at its most effective to build strength and suppleness, help avoid injury and combat muscular or joint pain. Be Light Fingered - Many skiers, especially beginners, grip their ski poles so tightly their knuckles are white. This is not only a waste of effort but also creates tension in the upper body and shoulders, which limits movement and flexibility. A light grip is fine. Know Your Joints - Discover where your joints actually are. When instructed to ‘bend the knees’ many skiers bend simply from the waist and the knees – the classic ‘bent knee bottom out, head back’ stance. The hip joint is near the groin and should be your ‘pivot point’. Nothing above the hip joint should bend or shorten, and you should be loose enough to be able to swivel your knees from side to side without moving your upper body. Read what some famous people have said about the Technique here.